It's well-known that many folks get pretty depressed at the holidays, and Charlie Brown is no exception; the festive nature of the period shows him more clearly than ever the problems of his life. He takes on the job of director of a Christmas pageant to boost his emotions, but as with most of his undertakings, it goes awry. How he and the others deal with this is what adds the depth and spark to the production. A Charlie Brown Christmas appears in an aspect ratio of 1.33:1 on this Blu-ray Disc. The show looked very good throughout this nice transfer. Sharpness was solid. The show always offered good definition and delineation, without any notable signs of softness. Moiré effects and jagged edges did not present concerns, and I noticed no edge enhancement. Source flaws were minor. I witnessed some specks and marks, but I thought most of those could be attributed to weak clean-up animation from the source. The transfer still had some messy aspects, but it was usually clean. Instead of the reasonably pleasing monaural track from the DVD, the Blu-ray presents a flawed Dolby Digital 5.1 remix. While a little superior to what I heard on the Great Pumpkin and Charlie Brown Thanksgiving Blu-rays, the soundscape’s broadness created distractions. Music didn’t provide stereo presence; instead, the score and songs simply spread to the sides without clarity. The same went for effects. Any localization was inconsistent and not placed well. The surrounds added bland support of the elements but nothing more, as they failed to deliver real depth to the package. Audio quality suffered. Speech got a bit buried in the mix, but the lines remained intelligible and fairly natural. Music seemed somewhat flat and muddy, and effects lacked spice. There was nothing wrong with the original monaural soundtrack; this attempt to “update” the audio just made it worse. How did the picture and audio of this Blu-ray compare to those of the 2008 Deluxe Edition? Picture improved, as the Blu-ray looked tighter and more dynamic; it didn’t blow away its predecessor, but it offered more pleasing visuals. Unfortunately, as I mentioned earlier, the audio went down in quality. I didn’t care for the sludgy multichannel remix; while the old mono track didn’t boast great power, it seemed more natural and convincing than this mushy reworking. Most of the same extras from the DE appear here. We open with 1992's It's Christmastime Again, Charlie Brown, a long-delayed sequel to the 1965 original. Wisely, it doesn't attempt to emulate that classic. Instead, it takes a looser and more glib look at the holiday through a series of minor vignettes. Next we find a 15-minute and 58-second featurette entitled A Christmas Miracle: The Making of A Charlie Brown Christmas. It provides remarks from producer Lee Mendelson, Peanuts historian Scott McGuire, director/animator Bill Melendez, Charles Schulz’s wife Jeannie, former network executive Fred Silverman, and animation writer/historian Mark Evanier. “Miracle” looks at how Peanuts made the leap from the newspaper page to the TV screen, aspects of the special’s development, music, cast and performances, animation and character design, missing scenes and controversies, the network’s initial opinion of the show, and its reception and legacy. A few ads open the disc. We get promos for A Charlie Brown Thanksgiving, and Charlie and Lola: How Many Minutes Before Christmas?. The platter also provides a clip for Classic Christmas Favorites. A second disc provides a standard DVD Version of Christmas along with a digital copy of the show. Both add flexibility for the viewer. The Blu-ray does omit one extra from the 2008 DE DVD: a bonus CD. That platter provided a “sampler” of Vince Guaraldi’s music. Dedicated fans probably already owned Guaraldi CDs anyway, but it’s still too bad more casual admirers don’t get this piece. While I also liked the It's the Great Pumpkin, Charlie Brown disc, this package probably offers the best of Peanuts shows. 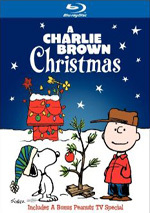 A Charlie Brown Christmas remains a classic after more than 40 years. Picture was very good, and I like the supplements, but the lackluster 5.1 remix offers audio inferior to the original monaural track. Even with the visual improvements found here, the old DVD remains the most satisfying incarnation of Christmas simply because of its superior sound.